20 silk saree blouse designs to wear with your favourite Kanjivaram or Banarasi saree! Silk sarees are a must-have in every desi woman’s wardrobe. While the variety of silk sarees in endless, finding the perfect silk saree blouse design seems like a hassle sometimes! But worry not! 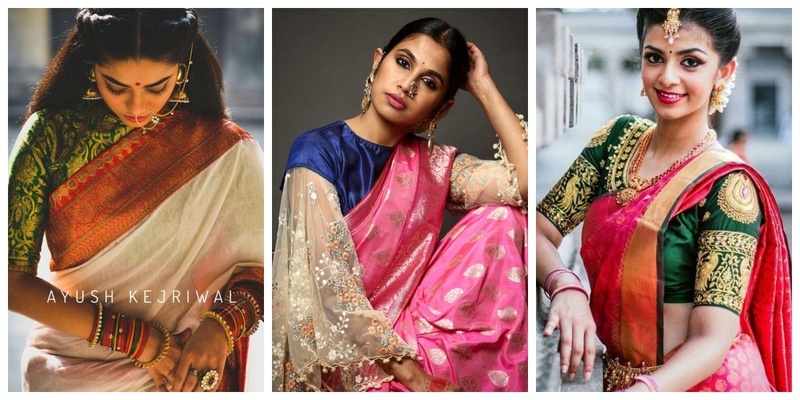 I have scanned the internet fashion radar to find the best 20 silk saree blouse designs to inspire you to stitch that perfect blouse to go with your precious Kanjivaram or Banarasi saree! Glance through the silk saree blouse designs catalogue and don’t forget to save the latest silk saree blouse designs that you love the most! Pick a drastically contrasting colour to your saree and stitch a silk saree blouse design that’s simple yet appealing. You can even take the border of your saree and attach it to the blouse sleeves for a gorgeous look! If you are not the one to stick to basics and want a bling and bright silk saree blouse design, then give this fully embroidered zardosi work blouse a shot and wait for the compliments to pour in! If your silk saree is printed or has heavy work, then it’s best to stick to a simple silk saree blouse design with half sleeves and round neck to make sure that the blouse doesn’t overpower the beauty of the saree. Brocade blouses have made their mark in the saree world because of its versatility. To stitch a silk saree blouse, simply pick a brocade fabric and go berserk with the design and you can still be sure that it will look amazing with your saree! You think two drastically different fabrics like silk and velvet can’t work together? Well, look at this bride smashing fashion rules by pairing this stunning velvet blouse with a kanjivaram saree like a total boss! Doesn’t this bride look like a goddess while pairing this mirror work and hand-embroidered silk saree blouse with a bright red and gold Banarasi saree? For those brides who like to keep it simple, this silk saree blouse design that matches the saree and has a basic pattern is just a classic choice to wear on their big day! Maggam work blouses are a rage among brides to pair with pattu sarees. If you love being in sync with trends then just hop on the bandwagon and get yourself a maggam work silk saree blouse to pair with anything from Kasavu to Banarasi saree! Nothing ever truly beats the beauty that lies in simplicity! This contrasting silk saree blouse with minimal border details are the sleeve will surely make you agree to the funda of simple is always the best! If you have a quirky sense of style then a contrasting raw silk saree blouse design with closed neck and half sleeves is something you can consider to wear with your silk saree! When it comes to experimenting with silk saree blouse designs, there’s clearly no dearth of ideas. This blouse has attractive gold embroidery all over along with sheer sleeves that make it look hatke. Are you planning to wear a heavy thread-work silk saree on your big day? Then it’s best that you stick to a simple silk saree blouse neck design and sleeve design in solid pattern to offset the saree and make it stand out. Tip: Go for a contrasting coloured blouse like this one to make a statement. Did you ever think that a basic handloom cotton blouse would complement a luxurious Kanjivaram? Well, look how regal this bride looks wearing a cotton blouse that’s made perfectly to fit like a silk saree blouse design! Unless you try out different styles of silk saree blouse designs to wear with a silk saree, you wouldn’t know what looks best. This crepe silk blouse with sheer puff sleeves looks opulent with this ivory saree, to say the least. Tip: Try stitching a silk saree blouse like this one with a pastel or light-coloured saree for a daytime wedding. Here’s another example of what happens when your silk saree blouse design experiments work like magic! Totally loving this quirky blouse design with huge sheer bell sleeves worn with a pink Banarari saree! This stunner of a silk saree blouse design with floral cut out back and heavy embellishment is perfect if you are looking for a fancy OTT blouse to go with your silk saree. Don’t you love it when a simply printed cotton blouse like this one transforms itself into the most gorgeous silk saree blouse design just by sheer styling and experimenting? Take a cue from this blouse if you have a similar plain silk saree to wear! Looking at this block printed cotton blouse paired with a rich silk saree just makes me go WOW! What a stark contrast of fabrics brought together seamlessly with great styling, right? If you are planning to wear a kasavu on your big day or just looking for silk saree blouse designs to wear with white or off-white silk sarees, then nothing beats a bright-coloured simple blouse with gold buttis on it! This silk saree blouse design is for the quirky bride who can’t get enough of experimenting with her bridal look. The one side-jacket with embroidery is a big thumbs-up when it comes to pulling it off with a plain silk saree! Let me know what you girls think about these latest silk saree blouse designs in the comments below!